It's a tale of perfect camaraderie and of co-dependence. After starting from the Canary Islands, Spanish territory near Africa's west coast, the pair sailed to St Bart's in the Caribbean before moving into the Arctic last August. "She was only about four or five months old then, and had never left the Canary Islands. I didn't speak any Spanish and she didn't speak any French, but we got along." Guirec had planned to bring along a pet for company, but a hen wasn't originally on the cards. "The hen was an ideal choice. It doesn't need that much looking after and I'm able to get eggs at sea. People told me it wouldn't work, that the hen would be too stressed and wouldn't lay eggs. Guirec says locals in Greenland have reacted with some curiosity to her presence - understandable, perhaps, given there is no poultry farming there. Image caption "Compared with people, she doesn't complain at all." While she is free to roam the deck most of the time while at sea, Guirec makes sure to put her back into her hutch when the weather worsens. "At the beginning, I was very worried - there would be huge waves and she might stumble, it would look for a second like she might go overboard, but she would always regain her footing. She's very brave. "But when there are bad winds now, I'm much more careful and she goes inside." Image caption "I won't lie, she can get on my nerves sometimes." One thing Guirec may also have to be careful about is quarantine regulations. While his and Monique's friendship survived its only encounter so far with customs officials, in Canada, he acknowledges it may not be so easy next time. Not that Guirec is apprehensive about the prospect of their relationship being broken up. "I'm not too worried about that," he says. "I'm a positive person." 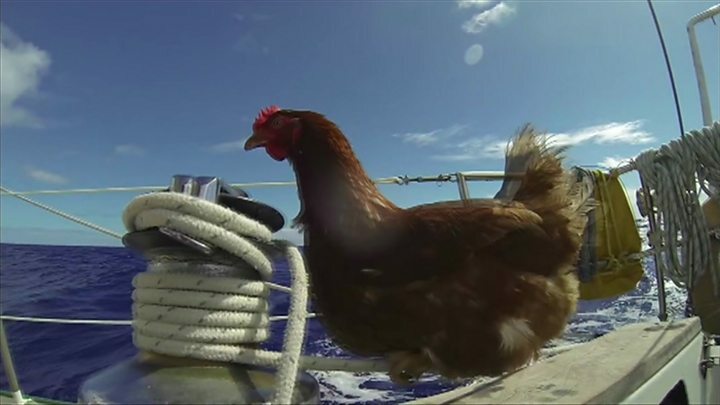 There are positives to be taken, too, from having a hen instead of another person on board. "Compared with people, she doesn't complain at all. "She follows me everywhere, and doesn't create any problems. All I need to do is shout 'Monique!' and she will come to me, sit on me, give me company. She is amazing. "But I won't lie, she can get on my nerves sometimes." So what do Guirec's family and friends make of his choice of seafaring companion? "They found it very funny," he says. "They've always known I'm not totally normal, anyway." The next part of the trip will take the pair through the Arctic and down the Bering Strait towards Nome in Alaska. "We're not sure yet," Guirec says. "We haven't talked about it yet, but we will. "We talk a lot, Monique and I." You can follow Guirec and Monique on Instagram and on Facebook.